Sometimes I sit down to dinner with people and I realize there is a massive military machine surrounding us, trying to kill the people I’m having dinner with. We should be inspired by people… who show that human beings can be kind, brave, generous, beautiful, strong-even in the most difficult circumstances. 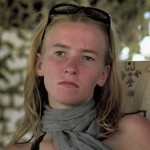 Rachel Aliene Corrie was an American peace activist and member of International Solidarity Movement from Olympia, Washington, who was crushed to death by an Israel Defense Forces armored bulldozer in Rafah, in the southern part of the Gaza Strip.